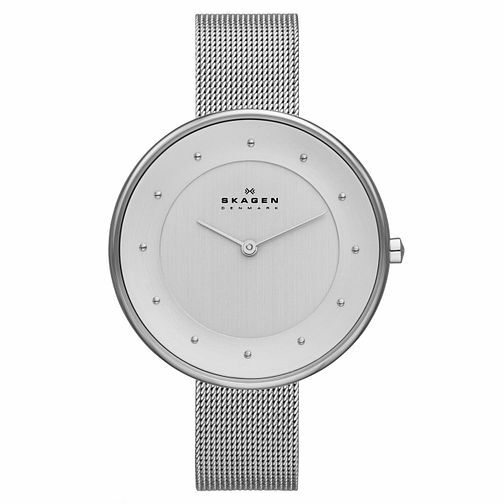 Embrace minimalist Danish design, with this sleek stainless steel mesh bracelet watch by Skagen, featuring a silver tone dial with simple silver tone markers. Perfect for paired-down everyday chic. Skagen Ladies' Stainless Steel Mesh Bracelet Watch is rated 5.0 out of 5 by 2. Rated 5 out of 5 by Anonymous from A real classy watch! Bought this for my wife. Her feedback was sometimes with presents I get it so wrong and sometimes I get it right. This was perfect, she said. High praise indeed! Rated 5 out of 5 by Anonymous from Skagen watch Just love this skagen watch. Simple, stylish AND a fantastic price. Speedy efficient delivery. Delighted.